I’m just going to say it: I really don’t get the whole chicken and waffles thing. I suppose I ought to try it sometime, before I write it off entirely; but there’s nothing about it that appeals to me in the slightest. However, I’m just crazy enough to take even an idea that appeals to me as little as chicken and waffles…and turn it on its head, to make something my kids (and I) like to eat. 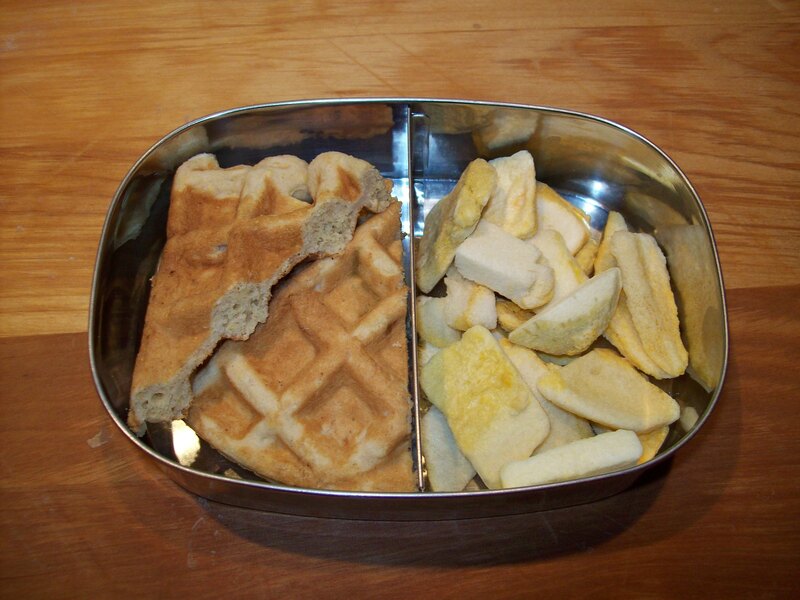 Here, I’ve put the chicken INTO the waffle, to make a perfectly portable lunchbox item. The grated apple adds just a little sweetness and offsets the cornmeal I’ve added to the batter for a slightly different texture and a nuttier flavor. Of course, I won’t judge you if you decide these don’t need to be confined to lunches — L. and P. have both had them for breakfast before, and L. took a quarter of one for his snack on the first day of kindergarten. They don’t need anything added to them, really, but a little extra maple syrup, some apple butter, or local honey would be perfect dipping options. Whisk together the flour, cornmeal, baking powder, and salt in a medium bowl. Make a well in the center and add the eggs, maple syrup, and melted butter. Stir to incorporate. Add the apple and chicken and mix well, then add the milk, bit by bit, until you get a batter that is thick but still pours slowly from a ladle. Scoop the waffle batter by level 1/2 cup measurements onto a preheated waffle iron. Cook according to your waffle iron’s specifications. You should get 6-8 waffles. Become a true RRG fan! © 2019 Red, Round, or Green | Just trying to get everyone fed.